But most significantly the email does not give details of the adjustments made to the temperatures, nor does it give the information required to derive the adjustments. Dr Salinger just discusses the changes in a general way and gives a few examples and that’s all. NIWA’s assertion that that email contains the requested information is not supported by reading the email. If Dr Gray had received the information he asked for in 2006, it would have made no sense to ask for it again last October, so the fact that he did ask again is further evidence that NIWA have never supplied the information and they are misinforming us and misleading the public. Even now, Dr James Renwick has not answered Dr Gray, neither has Dr David Wratt, despite a further plea from Dr Gray only three weeks ago. We are asking valid, reasonable questions of a public body, the very same questions which Dr Gray has been asking for many years. Why don’t they answer? It is unprofessional of them to refer to private emails and give replies that are readily shown to be unfounded. It might help to point out that the Coalition is not like Greenpeace, where members take orders from head office and write and speak on behalf of the organisation. We’re rather more independent than that—an association of like-minded individuals who study climate science. The organisation is not necessarily aware of private correspondence between any of our supporters and former employees of NIWA. The Coalition is a voluntary, unpaid amalgam of scientists, engineers, journalists and free thinkers, all keen to investigate different bits of the global warming puzzle, discuss it and try to understand it. The Coalition could not be expected to have access to Dr Gray’s records for years past. To expect the whole Coalition to know that one scientist was sent an email several years ago suggests mere ignorance; but to refuse to resend that email or a copy of a paper betrays a deep reluctance to help. And that’s disgraceful. If any other government department gave deliberately obstructive answers to questions from their clients (much less Parliamentary questions), heads would roll. The graph of the New Zealand temperature record on the NIWA website is based on just seven weather stations. What, precisely, gives NIWA confidence that they are representative of the whole country? What, precisely, are the adjustments made to the temperature readings at each of those seven stations, what is the raw data involved in making them and when were they each made? What, precisely, are the reasons each station was adjusted? We note that these questions are within NIWA’s area of competence. Information needed to identify the adjustments made by Dr Salinger. Information needed to develop their own adjustments. We put only three questions and they haven’t answered any of them! For seven stations, it would take about half an hour to pull out the figures and send them over. We would go away and so would any hint of scandal. What are they hiding? The longer NIWA obfuscate, produce red herrings, answer questions we haven’t asked and criticise us for what we haven’t alleged and haven’t challenged, the more suspicious everybody gets. They’ve made counter-claims that have persuaded many bloggers that we are a pack of ill-willed villains. We are, for suspicious reasons, asking questions to which we already know the answers! But when they say the information exists in a public record, they are deceiving us. We have looked very carefully, but they have not cited a single document containing the adjustments made to the temperature readings, and that raises a very natural supplementary question, one we hadn’t anticipated: why not? Peer review — anyone interested? Nobody! Typical. Some bloggers claim we’re attacking the NZ temperature record, since it’s well-known that we question claims of dangerous man-made global warming. There might be some merit in that, but it’s a bit soon for us to mount an attack on the record when we don’t know how the record was obtained. Those who excoriate us on those grounds must fear the changes won’t stand up to scrutiny, else why not support our demand to reveal them? We’re only asking questions. All we’re doing is scrutinising the record, as any good peer-reviewer would. This is peer review. Even the doubters and deniers approve of peer review, right? If not, why not? But NIWA have made counter-claims so we must respond to them. Are those counter-claims true? We have said nothing until now, save a couple of blog comments. We have been waiting politely, giving NIWA and Dr Nick Smith a decent opportunity to answer our questions through the proper channels before taking up an argument. Then on Wednesday last week, at a climate briefing for MPs by NIWA’s Dr Wratt, Nick Smith unceremoniously barred Dr Vincent Gray from attending, giving an unconvincing reason. Rodney Hide had invited Dr Gray along as a scientific adviser. We had been waiting politely for their reply before responding to their counter-claims, but with NIWA now clearly intent on frustrating our request, it looked like the waiting was over. Still, we kept quiet until the following Friday (a week ago), for the publication of the answers to the written Parliamentary questions. But those answers made it obvious they were not even pretending to be helpful. The gloves were off. So here, finally, is our response to each of NIWA’s points. It follows the numbering on NIWA’s web page headed “NZ temperature rise clear”. Their answer in italics, our response follows. For over two years the Coalition has had access to: The raw data. We didn’t ask for the raw data, but this statement is true. In July, 2007, NIWA finally stopped charging citizens for the public temperature data and since then it has been available on the internet for free. But this is a red herring, since our study says plainly that we downloaded the raw data from their web site, so we must have known it was there. This is a silly answer to a question we didn’t ask. For over two years the Coalition has had access to: The adjusted data (anomalies). This is not true. One of our members recently recalled that Jim Salinger (not NIWA) sent him personally (not the Coalition) several years ago a spreadsheet containing the adjusted data and he gave a copy to the science team working on the project. It was exactly what we needed to identify the stations and the gross adjustments, but we’ve had it for just a few weeks. In addition, it is not the adjusted temperatures, it is the anomalies, which require more work to interpret — and the spreadsheet does not contain either the individual adjustments or the reasons for them. We did not ask for the adjusted data. For over two years the Coalition has had access to: Information needed to identify the adjustments made by Dr Salinger. This is mush and hardly relevant. We asked for the adjustments; what kind of answer is it to say we already have “information needed to identify” those adjustments? What does that even mean? In their web posting “NZ temperature rise clear” they don’t support this answer, they fudge the point and cite no document. This assertion is vacuous and remains hollow without citations. For over two years the Coalition has had access to: Information needed to develop their own adjustments. This is not true. There are papers discussing methodology, but that doesn’t help us. There are several papers citing each other in a complex chain of references, each one giving some information, but none of them give a good enough description to replicate what Salinger did. They say the stations have been described, but where have they been described? Without citations this statement is unhelpful. They say our paper was based on analysing the seven stations without adjustments for site changes. No, it wasn’t only site changes, it omitted adjustments for any reason; that’s the point. We saw the graph they made, then found the data they provide. They don’t match. Tell us why not. The following indented, numbered headings are from NIWA’s web site; our comments follow. As we describe above, the Coalition was not involved in that exchange. Our scientists are well aware of reasons for adjusting temperature data and repeatedly mentioning Hokitika and Wellington does not satisfy our request for details of each adjustment. While it can be argued that Rhoades and Salinger (1993) is indeed public, when you actually read the paper, you find a tangled web of papers that cite each other (all involving Salinger somewhere), none of which provide all of the information. The Rhoades and Salinger paper was only submitted and not published, so it is unlikely the method used was international standard practice (the Rhoades and Salinger paper is the only one that specifically discusses the methodology, as it is a techniques paper). This reference does not answer our questions. This answers a question we did not ask by repeating a fact that our study plainly states. Dr Salinger (not NIWA) sent his spreadsheet with the adjusted data to a fellow scientist mere weeks after the Coalition was created, without any communication between the Coalition and NIWA. The spreadsheet contains nothing about the adjustments. They refer to a NZ Meteorological Service publication which we haven’t located yet and would appreciate a copy of. We asked NIWA why these seven stations were chosen, what the adjustments were and why they were made. They have not answered our questions, which would be considered reasonable in any normal peer review. We got back a torrent of assertions which don’t address our questions and a series of scholarly references that turn out not to contain the data we seek. This provides an object lesson in the very meaning of obfuscation. We are not deterred, however, because we think it’s very important to examine the NZ temperature record in order to clarify public policy. The ball is in NIWA’s court to reveal what the adjustments are. Then, based on our analysis, they need to demonstrate that they are valid. They made them, so they must explain them. To repeat what our study found: without the adjustments there is no trend—no warming—and under those circumstances a scientist takes extra care to justify the changes he has applied. We do not doubt there has been some warming—or else we would still be stuck in the Little Ice Age. Nor are we implying that NIWA have stooped to fiddling data. We are merely trying to get answers to queries their data raise. It shouldn’t be too hard for NIWA to list the actual adjustments to these stations. There are only seven of them. Nick Smith, in a letter to Rodney Hide dated 8 December, referred to standard adjustment techniques “described in the scientific literature” or NZ Met Service publications. But the argument that they used “standard techniques” is misleading. There are a range of techniques, each with advantages and disadvantages, and they must say which was used because there’s no other way to know. The choice of adjustment technique and how it is implemented are also important. In the case of the technique outlined by Rhoades and Salinger (1993), there is a high degree of subjectivity in relation to which data are adjusted and by how much. It is insufficient to state that the methods were standard, as when a subjective assessment is required there is a high degree of operator variability. Did Dr Salinger make all of the subjective assessments? Indicating that the data on station changes are available does not explain what adjustments are made. The adjustments that could be expected for screen changes, switching to AWS (automatic weather stations) and urbanisation were not made. Nor do any adjustments appear to have been made for any other recognised factors that influence temperature at a site. NIWA say that “information about changes” to the seven stations is in a report published by the NZ Met Service in 1992. They add that “much of this information” is also in the metadata in their climate database. However, it is unlikely that “much” information is equivalent to “all” information and thus it is unlikely to enable us to replicate what Dr Salinger adjusted, no matter how strongly they insist that we can. Why does the metadata not contain all relevant information for each station? What has been left out and why? The depth of NIWA’s obfuscation is obvious and must be repugnant to practising scientists and intelligent citizens alike. NIWA should simply help us to examine and understand the public data. What are they afraid of? On 5 December the NZ Herald joined the controversy, upholding the IPCC global warming doctrine with a story by Eloise Gibson saying NIWA had “taken the unusual step of publishing a graph of raw climate data on its website to answer critics who accused it of fiddling the figures.” Unfortunately the Herald succeeds only in bestowing a veneer of credibility on NIWA’s deceptive assertions and diversions; if only they’d done a little checking! Dr Renwick said that any selection of “reasonably representative” sites would show roughly the same trend. That is demonstrably untrue. He says “any selection” would show the same trend. But one must only look to our study to falsify that. It presents seven unadjusted stations that display no trend at all. Or does he not call them “reasonably representative”? If so, why do NIWA allow unrepresentative sites to be used for the national average? Because strangely, it was those very seven that they just happened to choose for the national average, which just happen to show no warming until they adjust them! We would like to know why Dr Renwick cites those 11 new stations and what relevance they have to the questions we asked about the seven stations making up the national average. We wonder if Dr Renwick considers them representative of the country, more suitable than the seven, or less suitable. Unless there are interesting answers to those questions we think the 11 new stations are only a diversion. That’s only partly true: as we explain above, NIWA refer to an email sent several years ago to an individual, not to the Coalition, and say it explains why they adjusted the data—but we asked for all the individual adjustments and their reasons. Still, NIWA can prove what they say—let them release the email and we’ll all see what’s in it. Then please answer our questions. … only to have it raised again two weeks before a major climate conference. “It does seem a coincidence,” he said. Well, it was coincidence—as coincidental as our study being published just a week after the CRU leak. We didn’t plan the publication, we released it as soon as the ink was dry. It had nothing to do with Copenhagen or the CRU; that was a bonus. Doubters of man-made global warming have gone into overdrive in recent weeks as world leaders prepared to agree to new cuts to greenhouse gases. This is not objective reporting, it is editorialising by Miss Gibson, a transparent attempt to link our fact-based questions regarding the NZ temperature record with the worst of global warming activism, without actually saying so. We wonder how Miss Gibson could be comfortable making these insinuations about our motives without asking us what those motives are. It is especially distasteful to see such tactics pulled out only to shelter a public utility engaged in patent obfuscation. The Herald once championed the cause of truth, of honest enquiry and public accountability. Long ago I gave a speech in their Reference Library which expressed, before the editor and many of the journalists, admiration for the paper’s reliable devotion to the truth. There may be few left there who remember that speech, but what do they think now; and what on earth are they doing? The Herald is brought low. We wonder why Miss Gibson is so in thrall to the established IPCC doctrine on global warming that she entirely fails to apply to this story that journalistic balance she presumably learned and lauded during her training. If we really could figure out the method easily from a single paper, as NIWA say we could, why couldn’t they? Why did Jim Renwick have to bring Jim Salinger back to figure it out? Couldn’t they do it without him? And if they couldn’t, how on earth could we? This doesn’t make sense, and NIWA must tell the truth. Stop obfuscating—just tell us the adjustments. Our scientists are still researching the papers cited by NIWA along with other papers uncovered by our research, some of which cast doubt on Salinger’s claim of strong warming in New Zealand since the 1930s. That research will not be complete until some time in the New Year. So NIWA should come to their senses and just tell us the changes to the national temperature record. If they are justified, then they are non-controversial, so just tell us what they are! If they are not justified, then they are controversial, and we still need to know what they are! If you don’t know what they are, you’ll have to bite the bullet and admit it. Our three questions are on the table. NIWA have not answered even one. Now a fourth, more ominous, question looms larger with every passing day: why don’t they answer? six obfuscations in three sentences, nice going NIWA! Yes, their waffling goes on and on, doesn’t it? Thanks for dropping by, Rob. Interesting they quote 0.3° to 0.6° — their official national graph, the one we’re complaining about, makes it 0.92°C! Large difference there between the globe and NZ. Also, Dr Wratt claims our future “warming” will be “moderated” by being in the middle of the ocean, even though the above figures would suggest our past warming has exceeded the globe’s by 50%. Would you mind giving the link to the page you’re quoting? It sounds believable yet it says nothing of substance. The marvel is that NZ scientists have been trying to get data out of these guys for decades — decades! And still they see reasons not to comply. We can only hope the NZCSC request to NIWA under the Official Information Act brings a result. I largely agree with you. NIWA should explain all the adjustments made to the data. However Richard, a point I want to make, is that based on what you’ve said above, and in your original paper — you do have a tendency to jump to conclusions at times, and perhaps be unnecessarily provocative and confrontational when it’s not warranted. This doesn’t help your cause, and it may be why NIWA aren’t answering your questions and being defensive. For instance, in the original paper you published you made statements like “there is nothing in the station histories to warrant these adjustments”, that they give “a false impression of warming”, and “it’s a disgrace”. However NIWA have given one example (the altitude change of the Wellington station) where one of their adjustments was valid. On that basis, the statements you made in your initial paper are incorrect. This is at least one adjustment (upwards) that was warranted. If you’d said there’s no *apparent* reason for the adjustments that would have been ok, but instead you’ve made definite statements that implies data fiddling. If I was an honest scientist at NIWA, that would ruffle my feathers too, and make me loath to give you information unless I had to. The question of course is why were all the other adjustments made? It seems implausible to me that large altitude changes would be responsible for all or most of the adjustments. Even for Wellington itself, there were other adjustments made that remain unexplained, seemingly unrelated to any change in altitude of the station. I have some experience in analyzing complex datasets as part of a decision making process. Sometimes, to reach a conclusion, assumptions have to be made without a definite and provable basis, dare I say it, on ‘gut feel’. Whilst not perfect, this is better than throwing all the data out and reaching no conclusions at all, just because a small element of doubt exists. So on one level, if the scientists at NIWA are honest, and the adjustments were valid but based on an imprecise method, I can understand their possible reluctance to articulate their methodology — especially if they thought you’re acting in bad faith and are there just to pick holes in it. On the other hand, I share your skepticism. I know from first-hand experience that subtle assumptions, one way or another, can tip the balance either way when analyzing complex data. If there was any pressure at all with NIWA to show a warming trend, they could easily sway the results that way without outright fiddling. I’m not saying this necessarily has happened, but I can easily see how it could happen. I suspect the Wellington altitude adjustment is not typical, and this example was given precisely because it was the easiest to explain and the least controversial – and that the others are not so clear-cut. So despite some reservations on how you’ve conducted this debate, NIWA do need to front up and show how they made their adjustments, and be prepared to argue the toss. Both sides need to focus on the facts, rather than the polemics of who provided what data to whom and on what date. Thanks for your thoughtful comments, Mark; I completely agree with you. Let me say again that our (the NZCSC’s and the CCG’s) only objective is to discover the temperature adjustments, the reasons they were made and the reasons for choosing those seven stations to represent the whole country. Many people have mistaken the nature of our study, and have overlooked the fact that we simply compared two things on NIWA’s own web site: their “official” graph of NZ temperatures and the “official” temperature data they make available for download. It turns out that they’re radically different, but there’s not one word of explanation for that. Why should we be expected to know the kinds of changes that might be applied, when ordinary citizens don’t know? They should spell them out very carefully. But even though we’ve forced them publicly to state: “we applied changes,” they have still not told us what those changes were or why they were made. This is a kindergarten dispute and could be laughed at if nothing depended on it. But the government is taking large amounts of money from us based on conclusions drawn from these changes to recorded temperatures, so we deserve to know what those changes are. You correctly state that in the original study we were “provocative and confrontational” but it is not correct that this made NIWA refuse to answer our questions and become defensive. The truth is that they have been behaving like this (principally in the person of Dr Salinger) since the 1980s towards, at a minimum, Dr Vincent Gray, Dr Warwick Hughes and Dr Jim Hessell. There will have been others. Note, too, that this behaviour was towards fellow scientists, not just to upstart laymen like me. It might be justifiable towards the impertinence of outsiders but it is reprehensible between colleagues. Our study did its job, of bringing this scientific request to public notice, but it did not precipitate the truculence from NIWA, it only put it in the spotlight. A good question is why can you be so level-headed and objective in studying this matter when they cannot? What is the nature of their emotional attachment to this issue that it interferes with what must be their scientific instinct? Those scientists are surely not ill-intentioned, but they are less than open. I agree with your analysis of the Wellington example NIWA so craftily volunteered. You might like to know that we think there are good reasons to question their adjustments between Kelburn and the airport and even perhaps reasons to challenge them. More on that soon. Though Niwa claim the adjustments were warranted, this has yet to be demonstrated. It is only what they say. This is where they hold the upper hand in the public perception, for without access to the figures and the methodology, we cannot “prove” their adjustments inappropriate. We cannot even challenge what we are not aware of! All we can achieve is hand-waving. They must first relent before we can judge the wisdom of what they have done. Our questions are aimed, effectively, at what Salinger has done, and he has just flown the coop! Fired from NIWA! One wonders if NIWA actually have any data left from his work, or he is hanging on to it. Wouldn’t that be interesting? The purpose of the request under the Official Information Act is to force them to release this public information; let us hope that the events following the CRU leak of emails give them an extra incentive to comply. You neglect to mention that all university libraries provide conditional access to theses many of which are unpublished but are subjected to assessment by qualified academics often from other universities. You wouldn’t say that because you desire to promote the idea that Salinger, the UN, General Electric, NASA, Scientific American, Nature, The Royal Society, The World Bank, the American Defence establishment, Heartland Security, the US Navy, countless scientific and academic institutions, and 97% of qualified climate scientists, all Governments including ours and even the oceans, glaciers and insurance companies are part of a giant conspiracy (probably concocted by alien reptiles) likely to be popular with the constitutionally deranged. Thanks for the information Stuart. Can you provide some links to show the US Navy and the World Banks’ involvement in calculating the adjustments to the seven station series? Oh, Stuart, how creatively abusive of you, if remarkably stupid. Alien reptiles — how colourful. This post is about the NZ temperature record, not the causes or magnitude of man-made global warming. Your hostility weakens when you try to describe my intentions — you’re incapable of it. But there has been much water under the bridge since this post. Please see Epic fail NIWA for the latest. That is impossible when the methodology has not been published — and publication does not consist of lodging a single copy in a university library. You must have overlooked that part of NIWA’s explanation. The people and organisations (i.e. the 97%) are obviously members of the Goremons Stuart. How else would you explain their belief in something with absolutely no empirical evidence? Surely being a member of the Church of Climatology yourself you must be aware of the other members of the congregation. Maybe it’s a big conspiracy by the empirical evidence against the church – i.e. no tropospheric hotspot, no evidence of positive feedback from water vapour, no warming in 16-23 yrs, no melting of Antarctica, no accelerating sea levels rises, no increasing intensity or instances of cyclones, hurricanes, tornadoes, droughts, floods, etc., etc. You’re right, Andy, no details were released at the time or later under an OIA request. The BOM expressed no approval of what NIWA had done, saying simply that they accepted what NIWA submitted and conspicuously refusing to say they had checked any of NIWA’s work. The BOM released only a covering letter. To call that letter a review is a joke. [Hot Topic think] “NIWA’s work was “independently” reviewed by the Australian BoM”. Amazing ignorance. The first thing we noticed on reading BOM’s letter was their statement that it was NOT a technical review. BOM doesn’t use NIWA methodology (whatever that is) for their own datasets e.g. ACORN-SAT. They discard adjustments of less than 0.3 C, I don’t think NIWA would be comfortable with that for the NZT7. Phase Two: what adjustment methodology exactly, did/will NIWA use for site moves post-Salinger and how did/will they justify them? The BOM/CSIRO methodology declaration is at least the standard NIWA should be aspiring to (and be held to) but Salinger (1981) doesn’t make the grade, or anything near it. NZCSET’s NZT7 has more publicly available supporting documentation (the ‘Statistical Audit’) including their methodology from peer-reviewed literature (Rhoades and Salinger, 1993) than does NIWA. News to me sorry. I thought it was kosher (in a science lit sense). At least the R&S method was such that it could be determined and applied (see ‘Statistical Audit’ Appendix). Exactly, and why pay RCLDC for carbon indulgences anyway when you can get them free here Magoo? I am fairly tolerant to religions but I wish they’d stop forcing us to pay for their views, and please stop putting up those eco-prayer wheels everywhere. BLASPHEMY!!! Only the annointed from Reformed Church of the Latter Day Climatologists may issue the indulgences – all others are false prophets from the bottomless pit of the missing heat. The great Goremon has spoken. a) Salinger (1981) – a thesis only accessible under duress, nothing specific? b) Rhoades and Salinger (1993) – an unpublished paper, but a specific technique? c) NZ Meteorological Service report/publication – title unknown, access undisclosed? d) Something else – e.g. subjective, think of a number? At least the range has been narrowed down a little. I don’t suppose he’ll be gracing us with his wisdom again. We are all far too simple to understand the intellectual landscape that he percolates through. Simple engineering types who solve real world problems are far too inferior to bother with, when one is discussing the failure of Marxism or other lofty thoughts. We are merely simple folks, to be guided through life like children lost in a confusing theme park. Guided by the “intellectuals” who know best. The Met Office would like to thank the following countries’ national meteorological services for kindly agreeing to the release of some or all of their climate data used in constructing the CRUTEM4 data set. Users of the data are required to abide by any additional conditions for re-use of the data requested from the national met. services as specified below. Seems to me that Salinger corrections to the NZ data ceased around 1981 – 1986 for stations supplied by Meteorological Service of New Zealand to UKMO/HadCRU after CRUTEM1 and only raw CliFlo data was supplied after 1981-86ish for subsequent versions. Therefore, the adjustment methodology applied to NZ stations changed from Salinger (1981) for CRUTEM1 to T. J. Osborn and P. D. Jones for CRUTEM4 (definitely) and CRUTEM2/3 (possibly) prior to that. Now where exactly are these stations and how many? As shown by this map there is a fair number of stations in the Australia, New Zealand and the US that got changed. 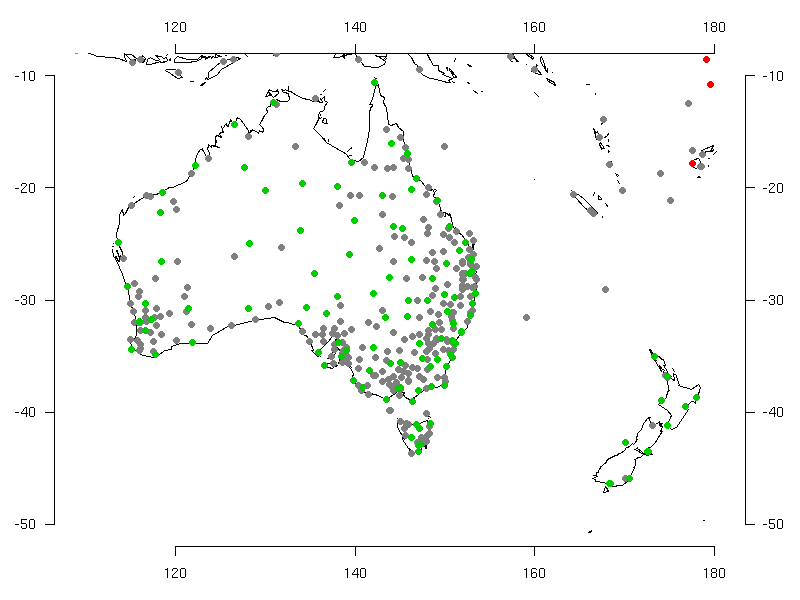 112 stations (29% of the total) in WMO regions 93, 94 and 95 – principally Australia and New Zealand – had temperature normals that were not equal to the average of the data for the station over the period 1961-1990. This happened because the station data were updated giving a more complete coverage of data, but the normals, which should have been calculated at the same time, were not. 16 in total for land + islands. A total of 16 corresponds with CRUTEM1 (see below) but the stations are not identical in each.. Remember that this is a 2010 update to CRUTEM3 so clearly these are NOT the NZT7 stations and adjustments as used by NIWA for their NZT7 (Masterton and Lincoln are missing). Which begs the question: why not, if BOM’s adjusted ACORN dataset was of sufficient quality to merge with CRUTEM4? The NZ stations start on page 49 pdf. There are 22 including islands (e.g. Chathams). In short, NIWA’s methodology (if we can call it that) was abandoned by UKMO/HadCRU from around 1986 in preference to their own. And at around 2010 was not considered by UKMO/HadCRU to be of sufficient quality (apparently) to be merged into CRUTEM3 as BOM’s ACORN was. Not a good look for NIWA. Salinger et al (1992) above states that the detailed homogenization procedure for the time series is described in Rhoades and Salinger (1992). Weather and Climate, 32(1), 23-­‐37. Submitted May 2012, revised June 2012. Salinger et al (1992) explicitly states in HOMOGENISATION PROCEDURES that “neighbouring stations” were used. This is what NZCSET used in their ‘Statistical Audit’ but NIWA used remote stations in their ‘Report on the Review’. Basically, NZCSET use the same comparison stations as NIWA going by their audit but the point is that NZCSET highlight R&S stipulating “neighbouring stations” but NIWA don’t adhere to that. Salinger et al (1992) does however (or at least they say they do – maybe, like NIWA, they actually don’t.